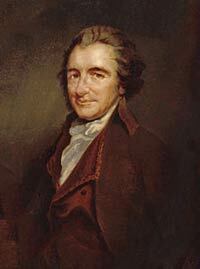 Thomas Paine was born in 1737 at Thetford located in Norfolk, England. He was the son of a Quaker and after a short-term education, he began to work for his father. He later found work as an officer of the excise, but he was not very successful and was dismissed twice from this post. In 1774, Paine met Benjamin Franklin who advised him to look for work in America. Franklin also gave him some letters of recommendation to help with his search for employment. In 1774, Paine landed at Philadelphia were his first job was that of a publicist. The next year, he published his first book entitled African Slavery in America and it criticized slavery as an unjust and inhumane practice. At the same time that he published his first book, Paine also had a job as the co-editor of the Pennsylvania Magazine. He began noticing that the tension was steadily mounting throughout the country, including the battles at Lexington and Concord of 1775. Paine believed that the colonies had the right to rebel against the government. The government imposed taxes on the colonies but denied the people the right of representation in the Parliament of Westminster. In his 1776 pamphlet entitled Common Sense, Paine described that sooner or later, England would have to stop slavery. He stated that America had lost touch with its mother country and he described the government as a necessary evil that would only become good after it was representative and subjected to frequent elections. Paine volunteered in the Continental Army during the War of Independence where he started writing 16 American Crisis papers. Between 1776 and 1783, he published his papers and became the secretary of the committee of foreign affairs in Congress in 1777. However, he was forced to resign in 1779 because he had disclosed secret information. In 1787, Paine left England to raise funds for a bridge that he had designed, but he got deeply involved in the French Revolution. This led to him publishing many editions of his book Rights of Man between 1791 and 1792. In his book Reflections on the Revolution in France, he defended the French Revolution against the attacks made by Edmund Burke. The book was banned in England because it was opposed to monarchy. But since Paine was already on his way to France (having been elected in the National Convention), he was not arrested. Paine was, however, imprisoned in 1793 under the rule of Robespierre because he voted against the execution of King Louis XVI. His book Age of Reason was published while he was in prison as praise for the Age of Enlightenment. As a result of this book, Paine was accused of being an atheist. After he was released from prison, Paine stayed in the country until 1802. He then travelled to back to America on an invitation by Thomas Jefferson. Paine had met with Thomas when he was a minister in Paris. Paine continued to carry out his critical writing targeting areas such as religion and the federalists. Thomas Paine died in New York in 1809. There were reportedly only six people who attended his funeral, including two freed slaves.